Ireland seems to have it all: gorgeous landscapes, incredible history and people who are widely considered some of the friendliest on earth. For all these reasons and more, many families plan a trip to the Emerald Isle at some point while their kids are growing up. In fact, it is often the first international trip parents take with their children. And Dublin is typically the launching pad for the rest of the vacation, since it’s the most popular point of arrival for international flights coming into the country. Make the most of your time there and have a plan to keep everyone entertained. I love spending my first day in any city getting oriented. Dublin is compact, so you can cover a lot in just a few hours. With school-age children, opt for a walking tour. The right guide will introduce your family to both the city’s main attractions and its colorful history, adding value to sites your family might explore independently later in the trip. It will also give your children a chance to interact with a local and get comfortable with the unique Irish accent, and it will put them at ease immediately with the friendliness of the people. 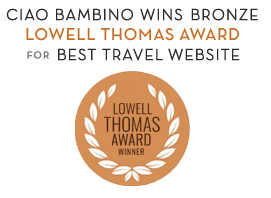 Our Ciao Bambino travel planners can connect you with wonderful guides and excellent routes to take through the city. TIP: Be sure to include Trinity College on your tour, or plan to visit at the tour’s conclusion. Here you’ll find the Book of Kells, one of the most ancient illuminated religious texts in the world. While the book itself often underwhelms visitors, the Old Library where it is housed will impress even the kids. Buy tickets in advance to cut down on lines. For younger kids, a Viking Splash tour is a good alternative to the walking tour. Every little transportation lover will delight in hopping aboard this amphibious, military-style vehicle, and it allows families to take in Dublin from the water in addition to land, as you venture up the River Liffey. The commentary will help parents gauge which sites they might want to return to later in the trip. TIP: Take the Viking Splash tour in the morning when traffic is lighter. Afternoon tours often end up caught in traffic, and this stretches the patience of young riders. A perfect activity to cap off Day 1 is to spend the afternoon playing in St. Stephen’s Green. After all, time outdoors is the best way to beat jet lag, and a big playground is the perfect reward (or bribe) for attentive listening during the morning’s tour. Many tours end here anyway, making this a convenient spot to relax before dinner. If the history buffs in the family get antsy, they’ll enjoy finding all the busts and sculptures scattered around the Green, recognizing many of Dublin’s most influential leaders. For families with tweens or teens beyond the playground phase of life, venture up Grafton Street instead. Shop and enjoy the colorful street performers, coffee houses and live music venues all along this pedestrian-only boulevard. The Guinness Storehouse — more kid-friendly than it seems! The day prior, you probably heard all about Dublin’s fascinating literary and military history. Now explore its darker side with a visit to Kilmainham Gaol (gaol is jail in Irish Gaelic, one of the many things families will learn!). It is necessary to pre-book a time slot to visit, as groups of 35 are led throughout the building, but tours only last an hour and then you can explore further. The experience is an interesting look at some of the jail’s famous inmates, like the leaders of many political rebellions. But it was also “home” to many ordinary people who committed typical and sometimes petty crimes, and visitors will learn about what their daily life was like during their sentences here. In the afternoon, lighten the mood and fill your tummies with an introduction to Dublin’s incredible food scene. Dublin might not have a well-known reputation for fancy cuisine, but it has actually been a pioneering hub of the local food movement for many years now. Take a walking food tour and sample the city’s many delights, from chocolate to cheese, to, of course… beer! If your family enjoys more of a hands-on food experience, consider booking a chocolate-making lesson at one of Dublin’s chocolatiers. Speaking of beer, many families think it’s not possible to incorporate a stop at the Guinness Storehouse with children, but indeed you can. The Guinness Experience (not far from Kilmainham Gaol) is actually a hands-on, interactive museum about how Guinness is made. And it ends at the Gravity Bar, where you have fantastic views over the whole city that kids will love capturing for perfect Instagram shots. TIP: Children under 13 are free at the Guinness Experience. So even if you don’t plan to spend much time exploring the museum and just want to say you had “a perfect pour” in the Gravity Bar, it’s not a huge financial or time commitment to visit for most families. As your time in Dublin winds down, plan one last blast of play and family fun in Dublin’s Phoenix Park. It is the largest enclosed city park in all of Europe, so families can easily spend a full day here. There is something to please everyone, from old military installations, forts and castle to Victorian walled gardens. They’re all ready for children to explore and wander while parents admire the beauty and history. You may even be joined by the wild deer that call this park home. More active families can rent bikes, take a Segway tour or even try orienteering, as there is a permanent course. Those with younger kids will definitely want to take note of the Dublin Zoo, also found in Phoenix Park — one of the largest in Europe. Fun fact: The home of the President of Ireland is found in the park. The Irish really do have more fun than the rest of us! If everyone is ready for an adventure outside the city, consider a day trip to Malahide Castle. It’s an easy train ride to the town of Malahide, and from the train station you can either hike to the castle or take a kiddie train there (called Toots; the kids will love giggling about that name!). Families usually take a quick tour of the beautiful castle via timed entry tickets arranged in advance, and then spend the rest of their time enjoying the grounds, including the adventure playground and lunch in the cafe. Experienced and happy family travelers know that the best trips involve a mix of education, new experiences and time to play. Dublin is a great city for all three, meaning everyone can find something to love. Editor’s Note: Photos by Nicole Wiltrout, Tourism Ireland and Ciao Bambino clients.